Yum! The pickled green beans turned out delicious. 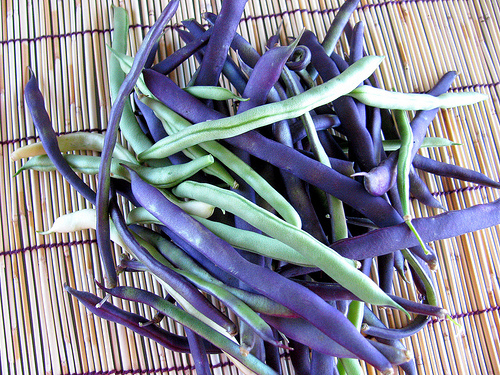 We picked a bagful of fresh green beans, some were green, some were purple. Sadly the purple ones turn a dull grayish green after they’re boiled. It’s super easy to pickle your own beans, they make a yummy snack and I love the way my jaw muscles clench up when I take a bite of their crunchy, dill and pickled goodness. 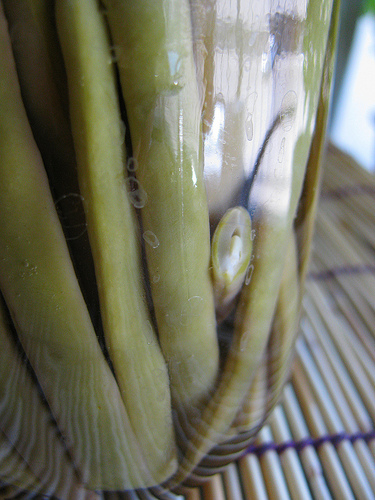 Normally canning beans requires pressure canning because beans don’t have enough acidity. But when you pickle them you can simply use the water bath method, which I love because I don’t need any special equipment. 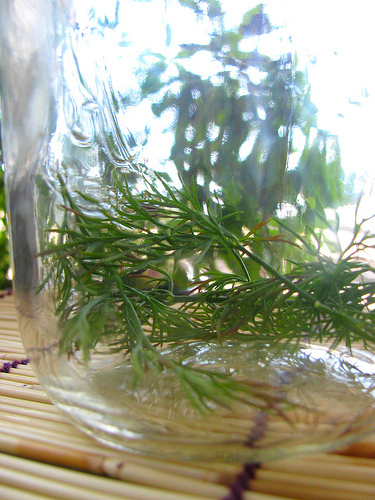 My CSA also gives me dill each week, so I’ve been using it a lot in recipes and for pickling. I LOVE dill! 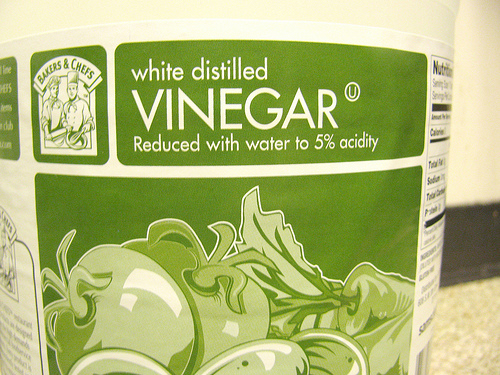 I also love vinegar. At some point when I was a kid, I saw an actor doing shots at a bar on TV. I think it might have been a western or something. I asked my mom what it tasted like she said it’s terrible, like drinking vinegar. So I sneaked a bottle of vinegar into the bathroom, lined up some dixie cups on the counter and poured a little into each one. Then I tossed each one down my throat and reveled in the tingling burn of vinegar and trouble. I’ve loved both vinegar and trouble ever since! Pickling has been a lot of fun. I’ve pickled carrots, cucumbers, beans, zucchini and beets. So far I’ve made up my own recipes, but I just got a book called The Joy of Pickling from the library and am excited to try some of theirs. You can expect lots more canning and pickling recipes through the fall. I’m working really hard to use the fresh, in season, SUPER AFFORDABLE produce available right now and store it up for the winter. Our shelves and freezer are packed! I’m especially excited to have a canning party on August 29th. I’ve got some berries frozen for making preserves, will be getting apples, peaches and picking a ton of plums for free at my work. I’m also considering just walking around my neighborhood and knocking on doors of people who have apple trees in their yard to ask if I can pick some. Maybe make some neighborhood apple pie. Do you do any canning or pickling? What’s your favorite food to can? 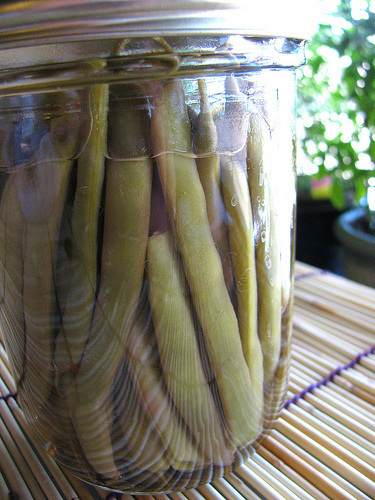 Cut stem from green beans and trim to be 1/2 shorter than your jar. Rinse them well. Bring a large pot of water to a boil. Using rubber coated tongs, lower your jars and lids into the pot. In a smaller pot add vinegar, water, salt, and garlic. Bring mixture to a boil. After jars have boiled 10 minutes, carefully remove with tongs. Put a sprig of dill and half the red pepper flakes in each jar then place beans in jars on end. Pour vinegar mixture into jars to cover beans. Use tongs to remove lids from boiling water. Using potholders or towels, screw lids tightly onto jars. Use tongs to put full jars into boiling pot. Process (low boil) for 10 minutes, remove from pot with tongs, and let cool on counter. If you press the center of the lid, it should not give. If it does, you can try processing again, or keep jar in fridge and use it up in a month. Approximate cost/serving: Vinegar is so cheap! I get 2 gallons at Sam’s Club for $3, the ingredients are only about 20 cents a pint. You can find jars cheap at garage sales or thrift stores. Vegetarian/Gluten Free: No changes necessary! I can’t seem to understand at what point the salt is added? I am new to canning, and might have missed something. I ended up adding the salt to my vinegar-garlic mix. Good question Ann, it’s a fault of my recipe writing. I had said “add the vinegar through garlic”. Changed the recipe to list the ingredients out in the instructions and think it’s much clearer now. Thanks for asking! What do I do with the other “half” of the red pepper flakes? Hi Michael, half of the red pepper flakes go in one jar and the other half go in the second jar. Enjoy!